It has now been more than a week since Washington acquired two new skaters before the March 2nd trade deadline ran out. 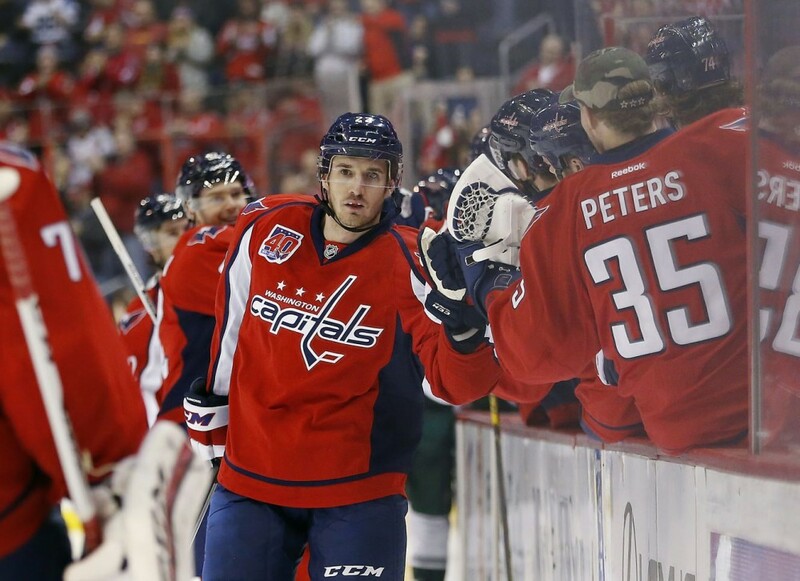 Even though there is a solid chance neither Tim Gleason or Curtis Glencross will return next season, both are counted on to be productive in the short-term in order for the Capitals to advance as far as they can in the playoffs. Even if trading defenseman Jack Hillen was never that big of an asset that will be missed, GM Brian McClellan did have to make some sacrifices to next summer’s draft class. While they will still have Buffalo’s third round pick from a 2014 Draft Day trade that gave them the draft rights to goaltending prospect Vitek Vanecek, McLellan surrendered Washington’s second, third and fourth round picks to get Glencross and Gleason. That leaves him with only that third round pick from Buffalo and his first round pick to work with in the top-100 of what is expected to be a deep draft class. In the meantime, let’s not focus on the future. Let’s focus on the present and see how Glencross and Gleason are doing in their new home. In his three games, the 32-year old started his tenure in a Capitals sweater in Tuesday’s game against Columbus on a second line with Troy Brouwer and Evgeny Kuznetsov. After giving up two goals while on the ice, however, head coach Barry Trotz immediately wanted to shake up on that line by partnering Glencross with Joel Ward, Jay Beagle and even Michael Latta. No matter the changes, Glencross would be outshot 4-9 in his 11:35 of ice time that night. Since that game, he has been on a checking line with Brouwer and Jay Beagle in which they have been given the most defensive posture from a zone start standpoint out of any line on the team. Now that’s not to say that anyone on this line can play a checking role, but Glencross was never that type of player in comparison to the other two. That being said, Glencross’ line did a solid job against Minnesota’s second line of Sean Bergenheim, Mikko Koivu and Chris Stewart. While the Caps were out-attempted at even strength 47.8-40.3 via score adjustment, Glencross held his own with an 8-8 shot attempt tie while he was on the ice and only a -0.1 score adjusted shot attempt plus-minus. Then on Saturday, like the rest of his teammates, Glencross feasted upon the worst possession team in the league in the Buffalo Sabres. Glencross’ line was all over Buffalo’s sorry third line of Tim Schaller, Nic Deslauriers and Cody Hodgson 18-5 as the team won the score-adjusted shot attempt battle 69.5-37.1. To top things off, Glencross would score two goals as a Capital while taking part of the second unit on the power play. Along with his two assists, Glencross is off to a hot start that welcoming, considering how much of a shooting slump he was in while playing his last set of games in Calgary. While Glencross has needed time to find the right partners, it was obvious from the get go where Tim Gleason would fit into Trotz’s lineup. While the 32-year old is no longer at the peak of his powers as a top pairing defenseman, he has performed admirably as a depth partner since returning to the Hurricanes and shaken the evils that is Randy Carlyle hockey. Since Nate Schmidt has been injured while on duty in AHL Hershey, Trotz mainly used Jack Hillen to be Green’s partner on the third pairing. The results were not great as Green’s possession numbers plummeted after easily being the team’s best defenseman in that category, deployments aside. Swapping Hillen and a fourth round pick for Gleason was a good acquisition, considering Gleason is such an upgrade to Hillen and that he would not be given that much time on ice, given the depth of Washington’s blue line and Green’s role on the team. If Gleason were to falter, Trotz should have a healthier Schmidt available to return to partnering Green come playoff time or, if miracles happen, Dmitry Orlov recovers from his broken wrist and returns to his role playing Green’s partner from last year. Overall, this was a win-win for Washington no matter what. Gleason started out strong in his Capitals tenure when he debuted against the Toronto Maple Leafs on March 1st and was the teams best score-adjusted possession player with a +8.5 plus-minus. While mostly out-attempting the Maple Leafs’ third line of Olli Jokinen, Leo Komarov and David Booth, Gleason on the ice for 21 shot attempts versus Toronto’s 14. Like Glencross, Gleason had his struggles in Columbus as he would mainly get shellacked by the Blue Jackets second line of Scott Hartnell, Marko Dano and Alexander Wennberg. Even if his shot from the point would lead to an Eric Fehr rebounded goal to make it 2-0, he was also on the ice when David Savard scored in the beginning of the second period to cut it to 2-1. Even if the Capitals won 5-3 that night and the Savard goal wasn’t entirely his fault (feel free to insert your interpretation as to how he should have handled his coverage on Dano’s drive to the net), it was not a great one for the newest members on the team. Against Minnesota, Gleason played slightly better, but he was on the ice for the Mike Green turnover that lead to the game winning tally by Jason Pominville in the third period. His usual assignments were covering the Wild’s bottom six lines, but the likes of Erik Haula and Kyle Brodziak would be the best possession players on the ice that night. Gleason would go on to be the worst possession defenseman in last Saturday’s game against Buffalo, but that doesn’t say much considering the hilarious margin of victory in all facets of that game. May we jump to conclusions, please? No you may not. There are still three more games against the New York Rangers and another two against Boston that will better test the Capitals within the remainder of the regular season. It can’t be stated enough that outside of Minnesota, Gleason and Glencross started their Capitals tenures against three of the five or six worst puck possession teams in the NHL. As stated before, you know what you are getting out of Tim Gleason: an aging stay-at-home defenseman that can still give you time on ice on the penalty kill if you need him, but certainly not at an elite level. At minimum, he’s a low risk rental that should not haunt the Capitals no matter what direction this goes as long as he makes Mike Green look good. Barring the mistake in the Minnesota game, that has been the case so far. As for Glencross, that could be another matter. I would like to see him play a more offensive game, especially if Trotz decides to keep having Andre Burakovsky play in Hershey throughout March and early April. I’m not saying he should be on the top line with Alex Ovechkin and Nicklas Backstrom, but having him with just as good offensive playmakers as him shouldn’t be a bad move either. That said, if Glencross continues to be so defensively implemented like he has been since the Minnesota game, it is another sign that Washington’s pieces along the second and third lines don’t fit to make this team elite for a deep playoff run now or in the long term. Major upgrades have to be made in order for this problem to be solved.